Visiting Fords Theatre in Washington, DC, could've cost us nearly $16. Instead, it cost us nothing. That's because I did a little research…which I'm going to pass along to you. 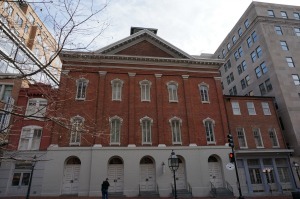 First of all, a visit to Ford's Theatre, the place where Lincoln was assassinated over 150 years ago, is well worth a visit even if an admission fee was required. But why pay a thing if you don't have to? First, let me tell you about the museum. Then I'll tell you how to get in for free. Centrally located in Washington, DC, only blocks away from the Newseum, the National Mall, the International Spy Museum, and lots of restaurants, Fords Theatre provides a glimpse into Lincoln's life during the Civil War, as well as the mere six days after that the war's end until the day he was assassinated. Through a variety of films, artifacts, and interactive exhibits, you'll get a better understanding of what Lincoln faced on that fateful night-- April 15, 1865-- when he decided to temporarily get away from the cares of the recent war and watch a play ("Our American Cousin") at the theater with his wife, Mary Todd Lincoln, and another couple. As you may already know, in the middle of the play, actor John Wilkes Booth, an ardent Confederate who absolutely loathed Lincoln, crept into the Presidential Box overlooking the stage where Lincoln sat, and shot him in the back of the head. Booth leapt to the stage, shouted "Sic semper tyrannis" (meaning, "thus always, to tyrants" in Latin), and fled. The mortally wounded Lincoln was carried across the street to the Peterson boarding house where he never awakened, and died the next morning. When you enter Fords Theatre, you will probably wait for your turn to start the self-guided tour at their excellent gift shop, which sells lots of Lincoln books, videos, T-shirts, and the usual. We had a good 20 minutes to wait until our tour started, which we happily spent viewing videos on a TV in the gift shop, including an excellent one which detailed how robbers tried to break into Lincoln's tomb year's after his death. It's really fascinating if you get a chance to see it. Once you enter the museum proper, you'll go down a steep staircase into the basement where you will view a number of artifacts and interactive exhibits which will bring you up to speed with what Lincoln was facing during the war. Items on display include the gun which Boothe used to shoot Lincoln. We had a good 30 minutes to kill in that part of the museum and while I and my husband really enjoyed it, my teenagers got a little bored after a while, and were antsy to get into the theater. The Presidential Box, where Lincoln was shot. 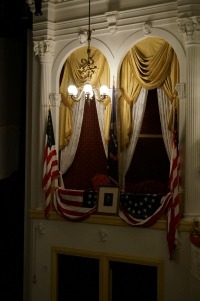 Once you're in Fords Theatre itself, you can sit down, imagine yourself watching the assassination unfold, or actually attend a play-- they sell tickets to 3-5 special programs or plays each day, although at an extra charge. Or, you can just do what we did, which was listen to a short but informative presentation by a park ranger since the theatre is run by the National Park Service (more on that later). Although you cannot actually go into the Presidential Box where Lincoln was shot, you can definitely go up to the doorway and look in. After your tour, you can cross the street to go to the Peterson boarding house where Lincoln spent his final hours, see the bed in which he died, and then tour another part of the museum which details the aftermath of the assassination. The Peterson Museum uses a variety of interactive exhibits to tell you what ultimately happened to John Wilkes Booth, details the failed assassination plot against the vice president and secretary of state, and gives you fascinating to bits like the origin of the phrase "his name is mud." 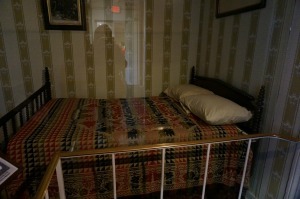 The bed where Lincoln died. That phrase originated when the doctor who treated Booth (who had broken his leg jumping to the stage after shooting Lincoln) by the name of Samuel Mudd, was later arrested. Although he did not receive the death penalty for his role in helping Booth (missed it by one vote! ), Mudd was sentenced to jail and his career was ruined, hence the phrase "his name is Mud(d)." As you go down the stairs to leave your tour, take note of the huge tower of books which represent just a small taste of all the books which have been written about Lincoln and the assassination. 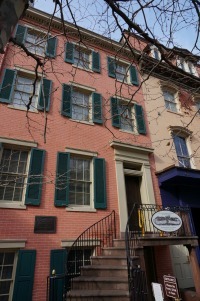 Peterson House, the boarding house where Lincoln died. So here's what you need to know before you get your tickets. Yes, you can purchase tickets online which will guarantee that you can get admission to the theatre at a specific time. But there is a $3.75 charge per ticket. That may seem cheap to you, but considering that this is a National Park Service site, and therefore, free, I didn't want to pay it. So why would anyone buy tickets which cost $3.75 per person when they could be fre? Well, if you're traveling off-season as we did (the first weekend in February, to be exact), there's absolutely no need to pre-buy the tickets because it's highly unlikely that you won't get in-- there simply aren't any crowds. On our Sunday morning in early February, there were possibly a total of a dozen people in the entire museum with us. However, if you go during the busy tourist time of year, roughly May through August, it might be worth your while to pay the extra fee and buy the tickets online simply to make sure that you can get in. Aside from traveling off-season, the other option for saving yourself the $3.75 fee for pre-ordered tickets would be to be at the box office in line when it opens at 8:30 am (probably by 8 am during summer), although there's still no guarantee that you will get tickets or that you won't have to wait several hours for an available tour time. It's up to you. The museum is open daily, 9 AM to 5 PM, and the last theater entrance is at 4:30 PM. The box office opens at 8:30 AM and Peterson House is open daily from 9:30 AM to 5:30 PM. Parking, local attractions, and a great spot to eat! There are number of parking garages nearby Fords Theatre, as well as metered street parking which you might be lucky enough to get, although it's very unlikely unless you visit on a Sunday when all street parking in Washington DC is free and far more open, or during the winter. Again, we visited the first weekend in February on a Sunday and were able to find a free parking spot right outside the Newseum which is only a few blocks away. We then walked to Fords Theatre, enjoyed our tour, and returned to Cosi, an excellent café across from the Newseum, for lunch. You can check out my review of the Newseum and Cosi here. Go to www.fordstheatre.org for museum details, to pre-order timed tickets online, and learn about plays and programs (remember, they are extra!) at the theatre. You can also get more information at the National Parks Service site.